Computer Viruses for Dummies Free Ebook Download. | Kanishk's Technical Blog. Computer Viruses for Dummies Free Ebook Download. Today I'll Share a New Ebook with you. The Name of this Ebook is "Computer Viruses for Dummies". It Offers real, Practical Solutions to help ordinary users keep viruses out of their E-mail Inbox and explains how to respond when one slips through. In 2003, there was a major virus attack almost every month, which costs businesses worldwide an estimated $55 Billion and did untold damage to Home Computers. Explains what Viruses are and how they work, profiles major Anti-Virus software packages, shows how to keep Anti-Virus software updated, and helps people adopt safer computer work habits. This Ebook is a free shareware and its compact size will make it irresistible to people who need to protect their Home PC or Network. 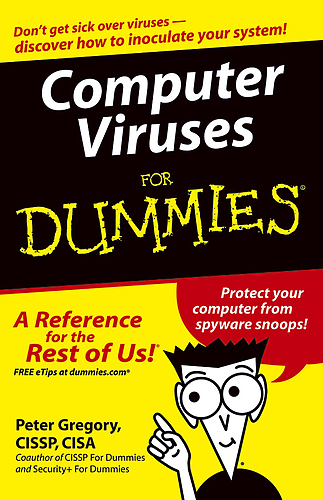 You'll find the Link to download Computer Viruses for Dummies Ebook at the end of this post. 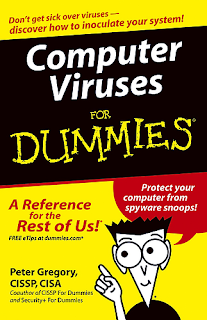 Given Below is the Table of Contents of Computer Viruses for Dummies. Part I : Evaluating Your Virus Situation. 2. Does My Computer Have a Virus? 3. Does Your Computer Have Anti-Virus Software? Part II : Deploying Your Anti-Virus Denfenses. 4. Obtaining and Installing Anti-Virus Software. 6. Scanning Your Computer and E-mail. 7. Ridding Your Computer of Viruses. Part III : Maintaining Your Vigilance. 8. Updating Anti-Virus Software and Signatures. 10. Using Firewalls and Spyware Blockers. 11. Protecting PDAs from Viruses. 12. Incorporating Safe Computing Practices. Part IV : Looking at a Virus Under the Microscope. 13. Viruses and the Losers Who Make Them. 14. Trojans Horses, Worms, Spams, and Hoaxes. 15. How Viruses Function and Propagate. Part V : The Part of Tens. 16. Almost Ten Myths about Computer Viruses.